Humayun’s tomb (Urdu: ہمایوں کا مقبرہ‎ Humayun ka Maqbara) is believed to be the tomb of the Mughal Emperor Humayun in Delhi, India and is said to be commissioned by Humayun’s first wife Bega Begum (Haji Begum) in 1569-70, and designed by Mirak Mirza Ghiyas, a Persian architect chosen by Bega Begum. But the reality is that, the site is an ancient ‘Vishnu Pada‘ (विष्णुपद) or ‘Vishnu Charan‘ (विष्णुचरण) hindu temple and Humayun was buried somewhere else. 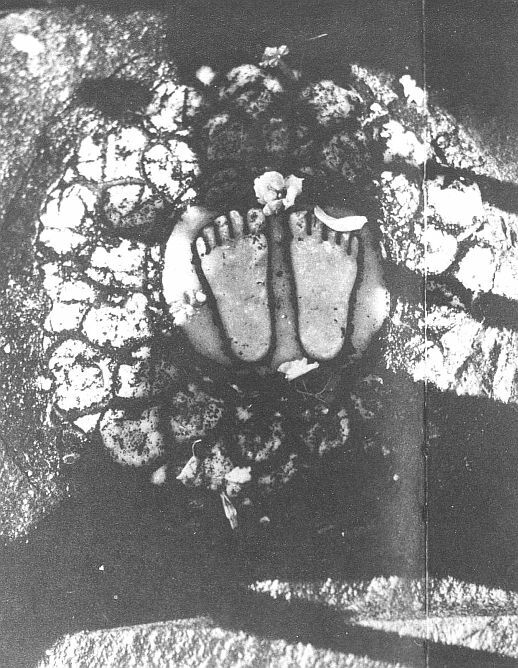 This is the photograph of the Vishnu’s footprint slab that had still survived until 1893 at the Humayun Tomb site. This photo was published by by Dr. Gustave Le Bon in 1893 in his book ‘Les Monuments des l’Inde‘ (The Monumets of India). Archaeologists in Delhi have never noticed these footprints or hindu temple style pillars at this place, which proves that they are heir to a lot of non-information and mis-information. 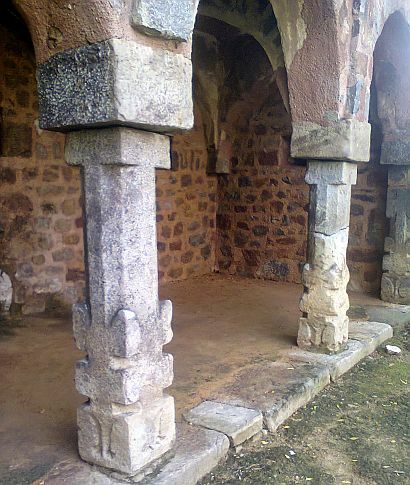 The left picture above shows pillars in style of ancient hindu temple architecture, re-used after destryoying a hindu temple and building a tomb here. In the background is a section of a typical Moghul fortress wall at the Isa Khan Tomb within the Humayun Tomb Complex. Eroded engravings on Temple Pillars which were used for construction of tomb of Isa Khan at the Humayun Tomb Complex indicates that they belong to a different era. Picture on right side above shows that the white quartz structure which is a remnant of the ancient temple is far more eroded than the red-sandstone rectangular structure dating to Moghul times. Sandstone erodes faster than quartz. The fact that the sandstone piece now is in better shape than the quartz structure proves that the quartz pillars are much older than the sandstone piece. So, an ancient Vishnu temple was destroyed and made to look like a tomb. Infact, Humayun was not at all buried in Delhi. According to Farishta’s chronicle (English translation by John Briggs, Vol. II, page 174) Humayun is buried in Agra, while according to Abul Fazal (Elliot & Dowson, Vol. VI, page 22) Humayun lies buried in Sirhind(Punjab). 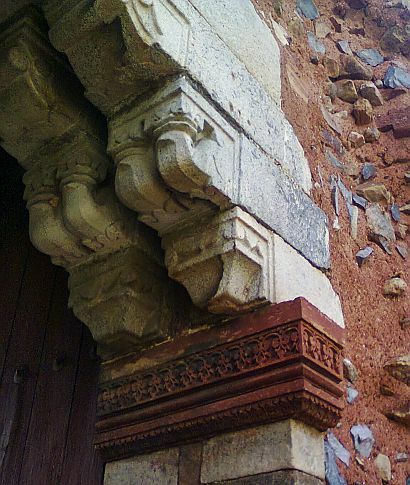 Above picture shows that ancient temple pillars were re-used as construction material at Humayun Tomb. 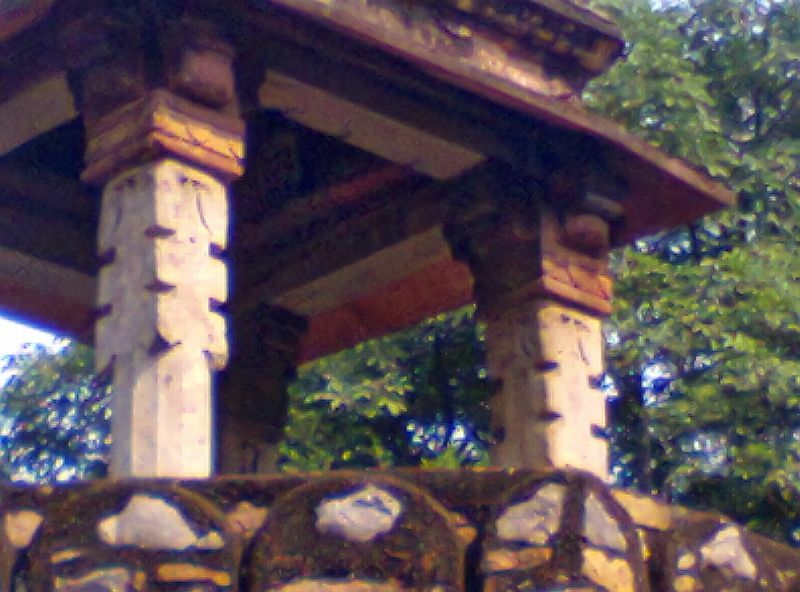 One can notice that the pillars were placed upside down in this ‘canopy structure‘ by the artisans in Moghul era.